The integrated wireless presentation and collaboration solution allows for sharing with any device and all operating systems. 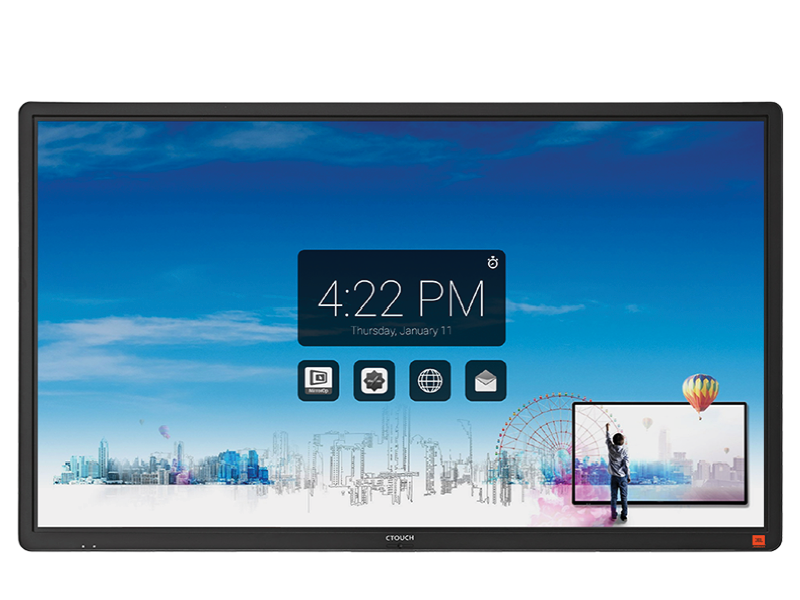 CTOUCH uses Barco’s MirrorOp app to ensure easy and fast wireless sharing. The CTOUCH Operating System is based on Android 7. Within COS, CTOUCH included easy to use, pre-installed apps such as; an extensive Whiteboard, APK installer, Aqua Mail, File Commander and Ofiice Suite. But you can very easily install your own favourite apps via the CTOUCH app store. The Adaptive Touch allows simulates natural handwriting, due to it having the power to adjust to the writing speed. When increasing the speed of writing, the touch frame will accelerate the speed of data processing. This creataes a fluent line, even when writing quickly, with an accuracy of less than 2mm. The dynamic pen allows you to easily adjust volume, open programs or simply use it as an air mouse. Get in contact with us here, or call us on 0843 886 4648 to speak to one of our education technology specialists.